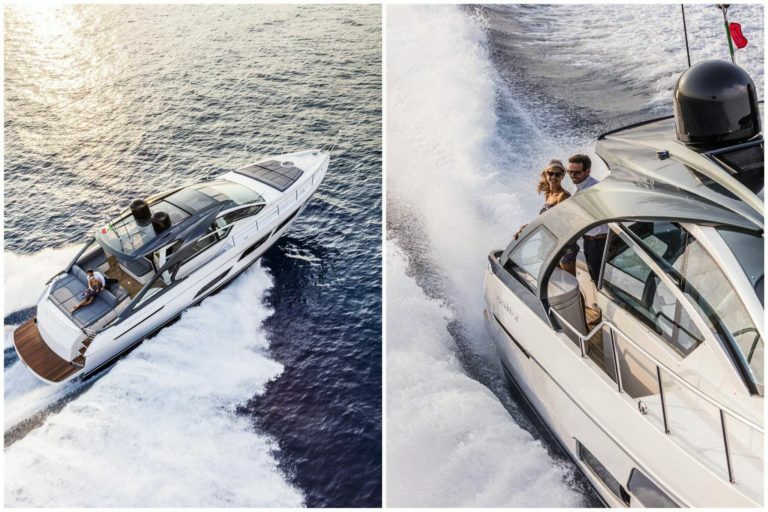 There’s a new thrill on its way from Pershing: it’s the Pershing 5X and it’s about to debut at the Cannes Yachting Festival 2016. X stands for extraordinary talent; for a performance whose limits are still to be tested; for a constantly evolving DNA. 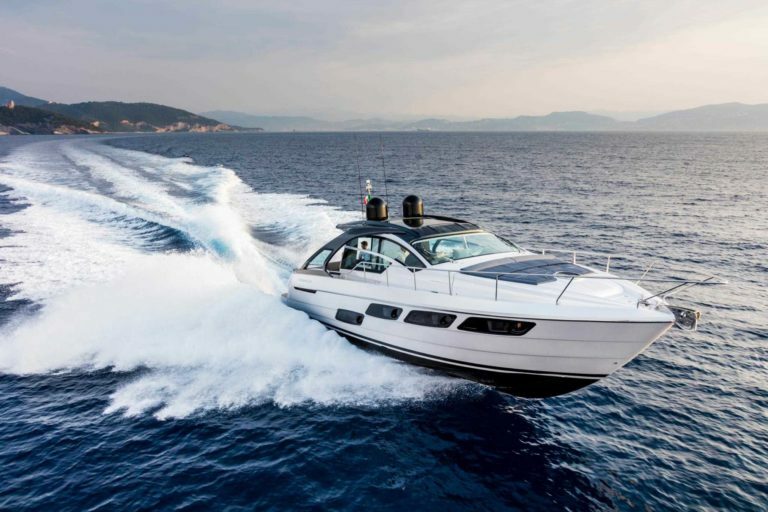 Every new Pershing creates a thrill that sends ripples of emotion through the terraqueous globe from the Mediterranean to central and northern Europe; from the United States to South America and Asia-Pacific, where Pershing has a cult following among motor yacht enthusiasts. 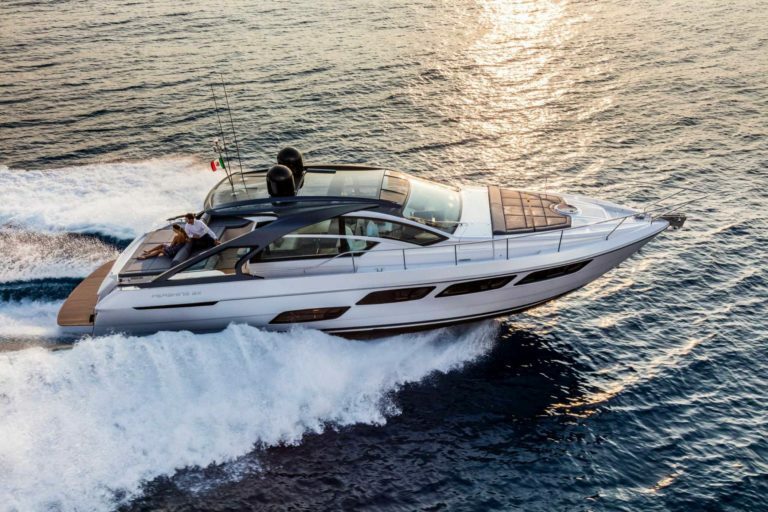 The Pershing 5X is the result of the collaboration between the Product Strategy Committee, Ferretti Group’s Engineering Department and architect Fulvio De Simoni. This bold coupé was designed to stir up emotions in over 80 countries where the brand is distributed. 16.51 metres (54.2’) long with a full beam of 4.38 metres (14.4’), it has an original hydraulically-operated platform at the stern that can be lowered more than 50 cm below the water surface, becoming a convenient submerged area for guests and the crew. By fitting a safety rail supporting a net or technical canvas, the entire area becomes a salt-water swimming pool where younger guests can play safely in the water. The garage can house a 2.8 metre Williams tender that slips easily into the water when the swimming platform is submerged. The cockpit is protected laterally by the two aerodynamic fins, the hallmark of latest generation Pershings, and has a large sun pad plus dinette. 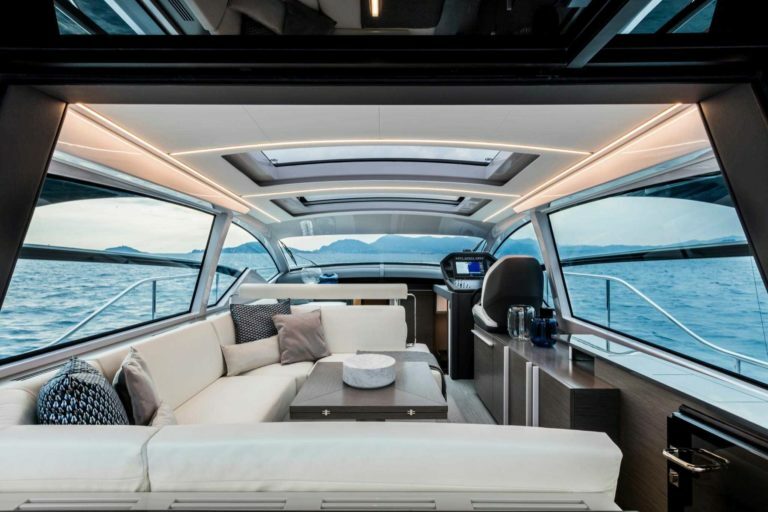 It can be separate or linked up to the interior saloon with the new system to open and close the glass door and windows. 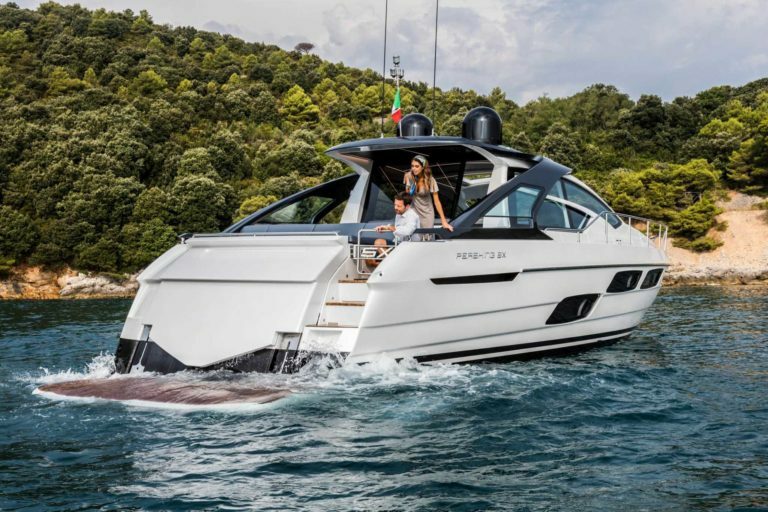 This solution is ideal for making full use of the yacht in all weathers, also thanks to the possibility to fit air conditioning on board as well as a new interior heating system with low impact on the environment. The main deck is divided up into a lounge with a dining table, starboard bridge and a second forward lounge. The front area of the ceiling is a sliding glass roof. On request, an extra fixed section, again in glass, can be added for maximum natural light. 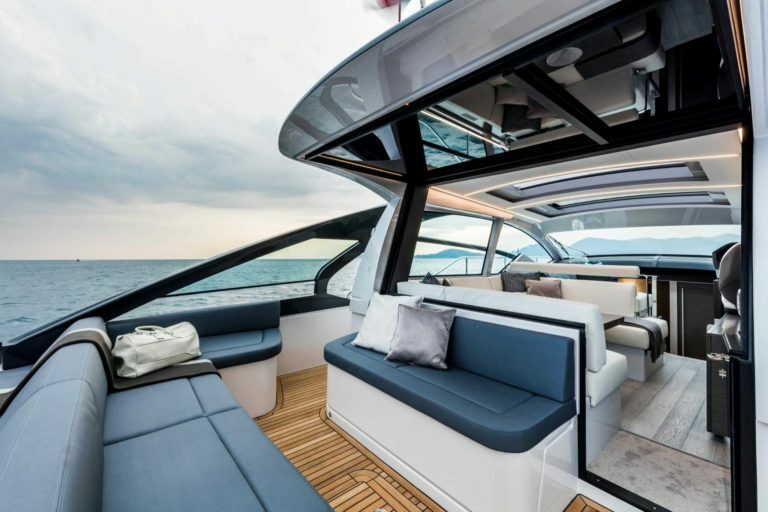 The lower deck was designed around the full beam master suite and its ensuite head. The traditional version also has a forward VIP cabin and a dinette opposite the galley. 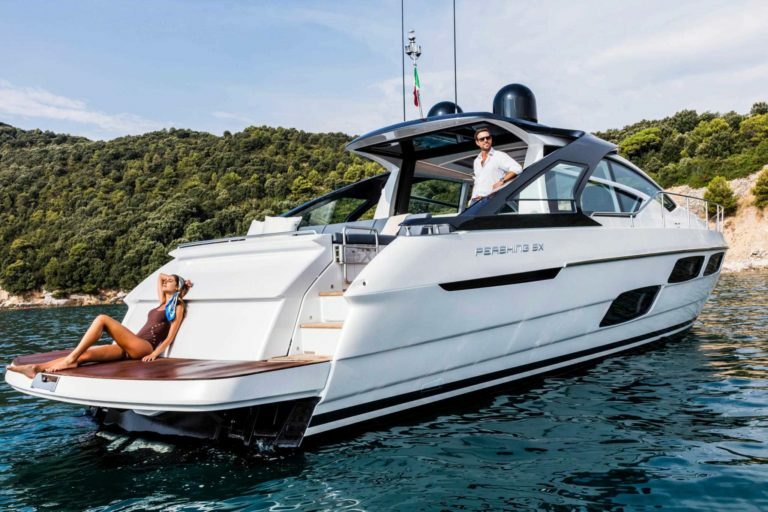 Alternatively, the layout can have a third guest cabin with bunk beds in place of the dinette, or a crew cabin with its own access from the deckhouse to safe the guests’ privacy. There are two engine configurations that result in different engine room layouts. It is possible to fit twin VOLVO D11 IPS 950 engines delivering 715 HP of power with azimuth thrusters with rotating propellers (cruising speed 30 knots, top speed 35 knots – preliminary data). Alternatively, two 1000 HP CAT 12.9 engines with Top System 75 surface propellers can be installed (cruising speed 41 knots, top speed 45 knots – preliminary data).